Stealing the ideas of Europe, the way to make America great again? 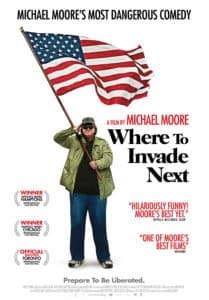 When Michael Moore invades Europe, he travels from country to country to investigate what the US can learn from our welfare societies. On his journey he discovers a generous paid vacation system in Italy, an education system without homework in Finland, human prison health care in Norway, and free higher education in Slovenia. Michael Moore’s 6th documentary is a humoristic and solution-based film that, without being too naïve or idealistic, points out a range of problems in American society. At the same time it is a reminder of the hard-won social rights that form the base of our European societies.